From left to right - Col Cseke, Tamara Lee-Ann Cardinal, The Honourable Ricardo Miranda, Pam Tzeng, Jarett Sitter, and Karimah. Minister of Culture and Tourism Ricardo Miranda has proclaimed January 2019 as the first ever Month of the Artist in Alberta. The month will be an annual celebration of artists and the value they bring to the province, both socially and economically. Alberta’s artists and the arts sector make important contributions to Alberta’s economy and quality of life. Statistics Canada figures show that in 2016, the visual and applied arts, and live performance industries in Alberta contributed approximately $1.3 billion in GDP. Alberta will also be the first province to launch an Artist in Residence program. This artist will be selected annually through a public, competitive process and will advocate and promote the value of artists, and lead conversations on the role of artists and arts in society. The deadline for applications was Monday, December 10. Visit the new Alberta Artist in Residence website for more information. The successful Artist in Residence will be announced in January. The Government of Alberta met with artists in the fall of 2017 and summer of 2018 to gather their input on what can be done to help support them. 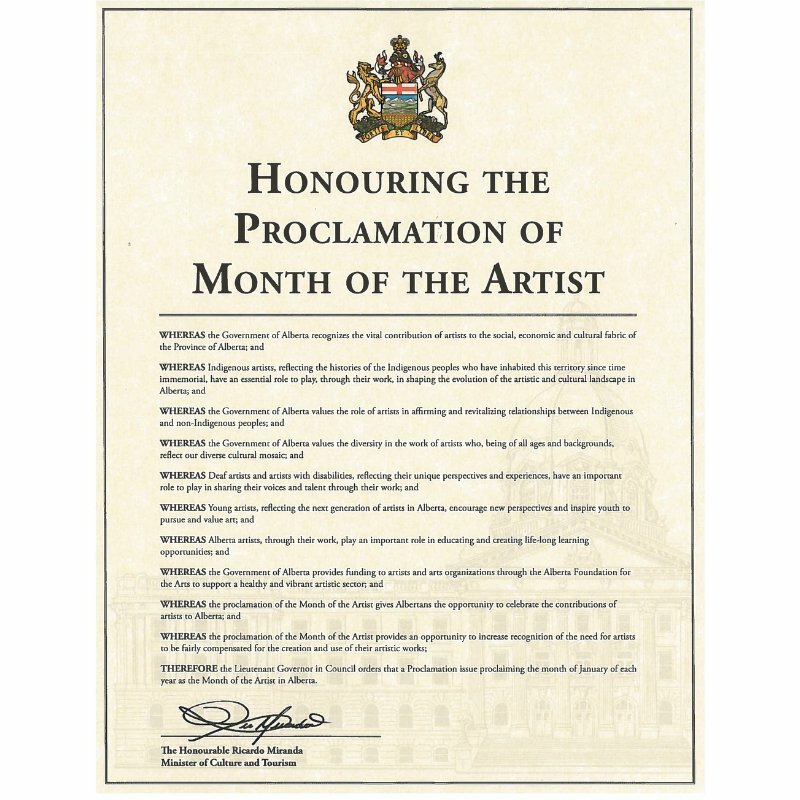 The language used in the Month of the Artist proclamation reflects their input, and officially recognizes the diversity of their work and their important contributions to Alberta’s social fabric and economy. The proclamation also specifically recognizes Indigenous artists, Deaf artists and artists with disabilities. About 85 per cent of Albertans feel that arts activities are important in contributing to the overall quality of life in Alberta, and 87 per cent feel that arts and culture activities makes their community a better place to live. (Source: Survey of Albertans on Culture). In 2016, 44,880 Albertans were employed in the arts, entertainment and recreation. (Source: Statistics Canada, National Household Survey, 2016). In 2016, Albertans spent $4,112 per household on culture and recreation goods and services, $632 higher than the national average of $3,480. Albertans spend the most money per capita in Canada on culture and recreation goods and services, including recreation equipment, attendance at live sporting and performing arts events, admissions to museums and package trips. (Source: Statistics Canada, Survey of Household Spending, 2016. Prepared by Alberta Culture and Tourism).